Bellingham Politics and Economics: Will we let the Dark Lord return? Will we let the Dark Lord return? The chart below depicts the last three general elections in Whatcom County. I will make no vouch for my statistical work, you can run your own numbers should you find error or disagreement with mine. Nonetheless, a tale of great hope is told below. Below are literally thousands of birthdays of those who voted in the last three Whatcom County elections. The 2006 and 2007 general elections show something typically bell shaped. In those elections, the great mass of war babies and baby boomers, now between 50 and 70 years of age provided the greatest bulk of the vote, until something magical happened: the presidential election of Barack Obama in 2008. We don't often stop to think about how much of the electorate living in this county are under age 50. We live in a time of history where cultural political icons (JFK, RFK, MLK, FDR) are only stories for us. Few of us can possibly remember them alive. Until the election of Barack Obama, I am not sure how many people thought about what political power would look like in the hands of Generation X and Y. (Don't you love those terms? As if our children will be last generation...Z!!). In the last general election, many age groups were energized. Voter participation rates broke records across the United States. But those of us Barack Obama's age and younger did something extraordinary. We produced a freight train at the front of that usually waning right-hand X axis. We blew up the bell curve. Suddenly, with less warning than one would assume, generations acted in concert to throw off the chains of one of the ugliest regimes in our country's history. How will this be repeated on Tuesday? Will we continue to exercise our collective power and destiny? Will we continue to reshape the political landscape? Or will we fall back into cynicism and apathy? Will we let that right edge trail to nothingness again? Sauron has been overthrown, but the spirit of the dark lord will endure unless we complete our task: to destroy the ring of fire forever. This Tuesday, please vote. Blowing up the Bell Curve. National trends and local elections. This is nice work, Ryan. This is an off year election. 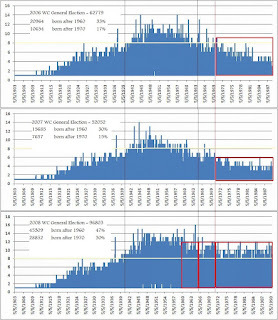 The odd years after a presidential election are typically the lowest turnout years. If there is a generational realignment, there are some corollaries to be drawn. Strange as it may seem, the right and left often look much like each other, though out of phase and inverted. If the shift to X-gen demographics is partly behind Obama's win, it could also be partly responsible for the Tea Party. If so, then the Tea Party draws on a legacy of Youth for Wallace, the YAF, etc. It's worth remembering that in 1968, Youth for Wallace was a larger organization than the SDS. You'll find that tidbit buried in the footnotes of Lipsett and Raabs, "The Politics of Unreason." As the boomers tore the Democrats up in Chicago in '68, so might the Tea Party be doing the same thing to the Republicans now. Political realignments happen when one party fissions and a portion crosses the aisle and joins the other party. It's a unique feature of two-party systems and a very different dynamic than coalition shifts in parliamentary systems. There have been two realignments in the last 100 years: In 1914, Rooseveldt took the Bull Moose progressives out of the Republican party, giving the White House to Wilson. The realignment solidified in 1932 with FDR's election. The second realignment started in 1948 with the Dixicrat revolt, bore first fruit in the '64 election, morphed into Nixon's Southern Strategy and culminated in Reagan's election in 1980. If this apparent realignment is taking place, the neaderthals in the Republican party will chase the Tea Party (by following, not leading) into a situation where Republicans can't get elected. For the players, like Specter for instance, who want to stay in the game, the only option will be to cross the aisle. The next congressional elections will tell the tale. It will be interesting to see how this year's election charts out demographically. The off-year sag will play a part, but the trend looks like more than a statistical artifact. It would also partly explain the Port elections (with their high falloff) as a failure to engage a youth vote.